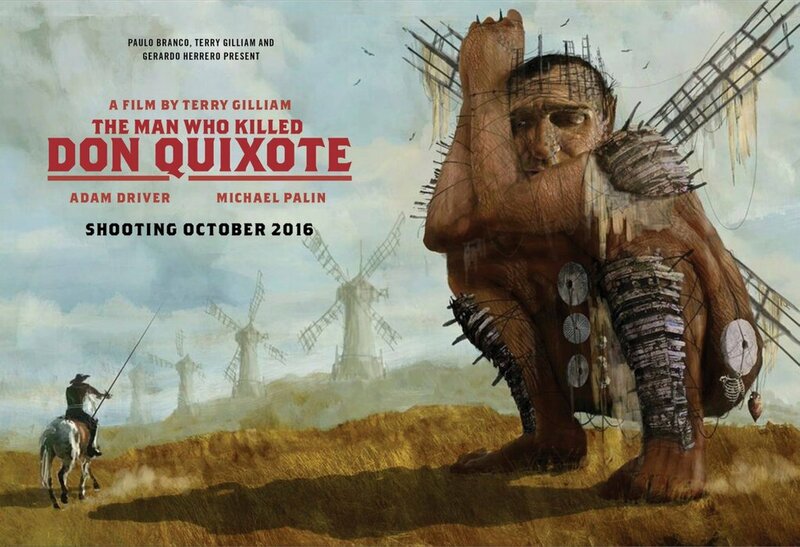 "The Man Who Killed Don Quixote" Is Happening, Apparently? You ever have an awareness that something is gonna happen, but you got tricked before so you're totally not falling for it this time, and then it actually happens and you're like... well, okay. That's The Man Who Killed Don Quixote for me. And you. And the rest of the world. Like, seriously, I watched a movie several years ago about how this wasn't gonna happen and now it's happening, what the hell. 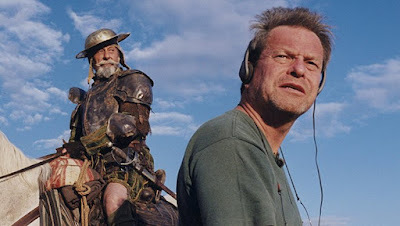 For anyone who missed this weird and frankly fully Gilliam-esque story 17 years ago, I highly recommend you go and watch Lost in La Mancha. You can stream it off Amazon for a few bucks. A couple of the faces in it have been Weinsteined in recent years, but the process still stands regardless of who the involved actors are. Lost in La Mancha was originally conceived as a "making of" documentary for The Man Who Killed Don Quixote. Keith Fulton and Louis Pepe, who headed up The Hamster Factor and Other Tales of 12 Monkeys back in 1996, had permission to come out to the set and document the process on his new film. They were, quite frankly, not expecting to make a documentary about a movie that simply could not get made. Watching the film is an exercise not in vicarious embarrassment such as vicarious pain. It's no exaggeration to say that it seems like the universe did not want this movie to be made. Everything from suddenly disobedient trained animals to the desert literally blooming overnight stalled production on an almost daily basis. Again, seeing it for yourself is far more effective. But suffice to say, whether you believe in a higher power or not, there's genuinely something out there that was not about seeing this film get made. More than a decade later, the project resurfaced, this time led by Michael Palin and Adam Driver. And I... didn't believe it. Of course. You can't blame me. I don't think anyone could be blamed. Michael Palin has been replaced with Jonathan Pryce, who seems to be doing an admirable job in the role. And it's a bit hard to tell... but instead of the Sancho Panza analogue (first Johnny Depp, now Adam Driver) being sent back in time, we appear to be working with either the real Don Quixote or someone who believes himself to be. But there's a mix of modern and classic throughout, leaving even us unsure how the script has changed between the original release and now. The movie's original form involved Depp's character being sent back in time to fill the role of Sancho and, as the movie states, kill Don Quixote. 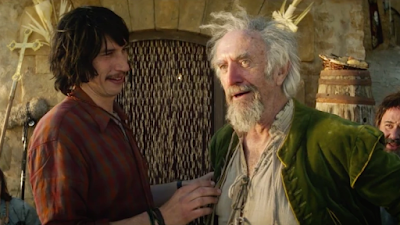 will Adam Driver's "Sancho" have the same task? Up front, it looks like a new spin on the story of The Fisher King, which was already Don Quixote by way of Thomas Malory. 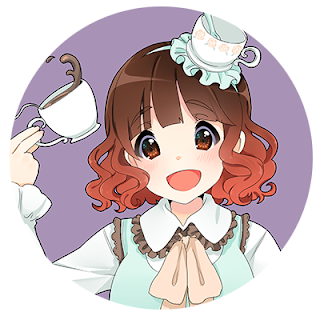 So seeing the same themes readdressed may be fun. 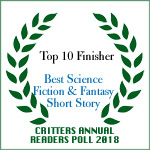 Too, there are multiple ways to tell that story. And The Fisher King needs an entire article of its own, frankly. Am I looking forward to it? I really wish I could say I am. And that's not a knock against the movie. It looks beautiful, colorful, and perhaps like it was waiting for this exact set of circumstances to be made. But I can't say I'm looking forward to it, because it still may not get released and I don't want to get my heart broken again. Apparently a producer from the previous version of the ill-fated film is claiming that they own the copyright, and that it can't be released as is. What will happen? No idea, but this claim kept it from film festival releases. We'll all keep our fingers crossed. Because it's been a while since I've waited this long for a movie.